My apologies if you saw an earlier version of this review, I accidentally published it before it was finished. There’s also a very good article at Uniken (UNSW) by Chris Sheedy and Steve Offner. Called Busting the Anzac Myth, it challenges some of the myths Australians have come to believe about the Anzacs. Great review of what sounds like a brilliant book: thank you. Thanks for the review of this book. I hope, as you say, many will actually read it and consider James Brown’s educated point of view; consider he’s not denigrating the service given by many but supporting the service many still give! The obscene amount of money about to be spent ($325m)could surely be used more wisely; some at least, should be supporting the families of our contemporary heroes and heroines. Your comment about ABC journalists is particularly apt – I assumed they spoke the language if they report from another country – surely a basic requirement? If not, I see it as an insult to those countries but also to the audience, as any report would never be fully informed! I agree entirely about journalists not being fully informed: my favourite example is from when the Dutch Queen died, and an Indonesian commentator was asked for a comment, since the Dutch had been their former colonisers. The translation in the ABC TV subtitles was a polite and apparently respectful remark about how they had no animosity etc., but what was untranslatable was that the speaker did *not* use the word ‘beliau’ which is the very polite 3rd person plural, the word that should be used for a member of a royal family, but rather used the word ‘dia’, the word used for everyday people like you and me. In other words, the domestic Indonesian audience heard a lack of respect for their former Dutch rulers, but the journalist never knew it. To be fair, there is a multiplicity of languages in our region and it would be impossible to have fluent journalists in all of them, but I think that we should definitely have a pool of speakers of Indonesian, Chinese, Japanese, Vietnamese and Hindi. Australia has plenty of speakers of Chinese, Vietnamese and Hindi to draw on, and if the media promoted a policy that these languages would be an employment advantage so that wanna-be journalism students learned them, things would surely improve. A very interesting article Lisa. Although there is quite a lot about WW1 in our media, I do not get the feeling that the average Brit is very interested in it all. I think the problem for us is that the whole thing has been covered so well by countless dramas and movies that it’s difficult to find anything new to say about it. The current controversy in Britain revolves around whether we should be proud of our contribution to WW1 or not. Historian Niall Ferguson led the charge by saying that WW1 was completely unnecessary and we should have stayed out of it altogether. Perhaps the strongest legacy of the war is the WW1 poets who have so ably fed pacifist thinking for the last 100 years. Interesting what you say, Tom. And I read just yesterday that Germany has no commemorative plans, consistent with the prevailing view that their C20th military history is best left alone. I am still thinking about what I’ve read in Brown’s book, but I’m starting to wonder whether really it’s the Big Business agenda that’s actively pushing all this commemorative stuff, rather than people actually wanting it. It’s a bit like sport, constantly in our faces because it’s Big Business and the media is onside. We’re always being told that Australian love it so, but research actually shows that people spend more time and money on the arts than they do on sport. LOL, I’m not sure how a senior Commonwealth Public Servant, presumably from Canberra, would know what bogans want, I’m thinking of those phone surveys I’ve done and trying to remember if there was a question about being a bogan… Do you identify as a bogan? yes/no/a little bit etc. Tick the box if you are a bogan etc. 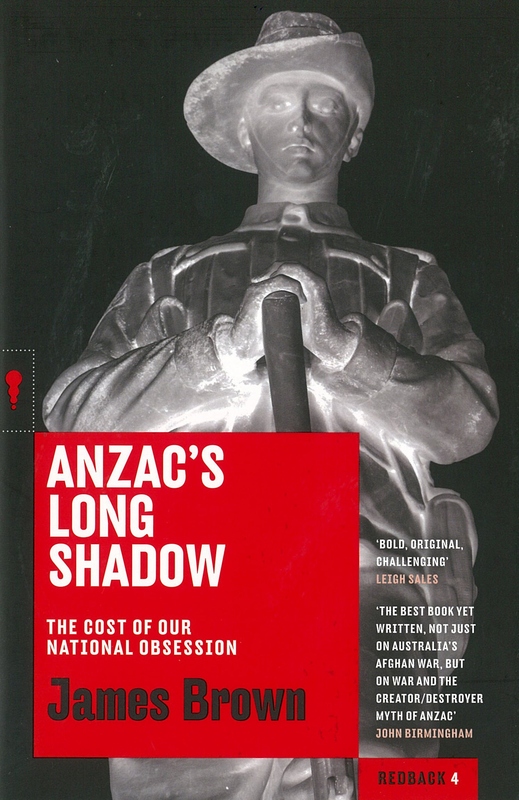 But seriously, I’ve been talking about this book at the photocopier at work, and my earnest, good-hearted primary school teacher colleagues (none of whom are bogans as far as I can tell) have been a bit shocked by my temerity and a bit defensive about their adherence to Anzac mythology. They were also somewhat disconcerted last year when I circulated a news article about the Simpson posthumous medal debacle which revealed that actually he wasn’t any braver than the other stretcher bearers and that his use of the donkey meant that he only helped the less seriously wounded anyway. And speaking for myself, it was only when I started working in the school library and kept getting costly curriculum materials from DVA year after year that I began to question what was going on. No other government department ever sends us anything for free, certainly not anything for teaching literacy or numeracy which could be really useful. No, I think it’s more a case of the usual complacency of ordinary Australians drifting into something that’s not what they really want, but now don’t dare to question. Perhaps my generation and younger feels a sense of constraint around WW2 veterans, we remember how upset they were by the Vietnam War protests and think it’s pretty harmless to let them have their endless expensive commemorations of yet another battle and to have high profile burial ceremonies for scraps of bone found in a corner of a foreign field? It’s Brown’s book that makes me realise that it’s not all that harmless after all. Very perceptive analysis. Drift can be very potent. Questioning has its cost: associates in Honest History who have questioned the Anzac myth all receive hate mail in response. As for the DVA flood teachers can always be referred to the resources on honesthistory.net.au as a balance. Lisa, I’ve also had a lot of defensiveness and push-back from my youngish (30s & 40s), left-leaning, non-militaristic, non-patriotic friends when I ‘dishonour’ or question the ANZAC myth: it seems it’s sacred even among many of those who you’d expect to be sceptical. That’s an interesting piece, David: thank you.